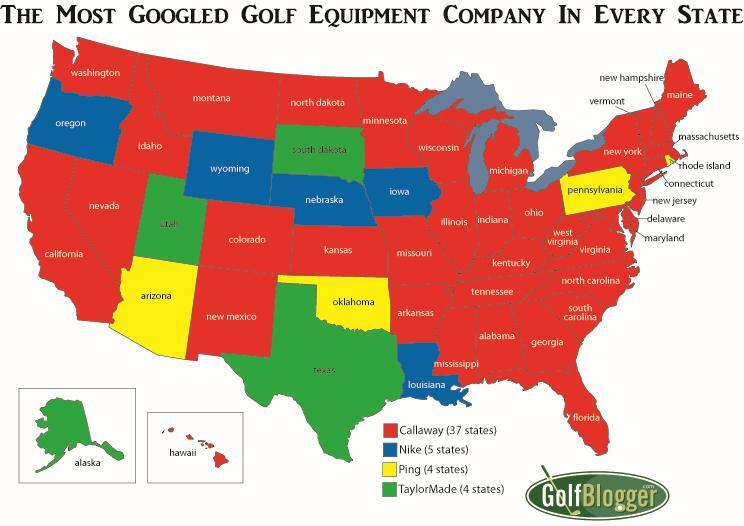 What is the most Googled golf equipment company in your state? I don’t think the result is what you would expect. To answer the question, I used one of Google’s search data tools to drill down to the state level. For each state, I looked for the most popular search associated with golf equipment over the last five years. I was surprised to find that in every state, the most popular golf equipment search was “used,” or some variant, such as the name of a used equipment retailer or auction site. That result was interesting, but not what I was looking for. So, I bypassed those, and instead settled on the first manufacturer that showed up in the results. The result of the data crawl to find the most Googled golf equipment company is in the map above. As surprised as I was to learn that “used” was the top golf equipment search, I was even more so to find the way Callaway dominated the results. In 37 states, Callaway was the most searched-for golf equipment company. Nike was second with five states, followed by Ping and TaylorMade with four each. Callaway was in the top three in all states. Callaway’s dominance should not have come as a surprise. In its 2015 annual report, at least, Callaway claimed the highest hard goods dollar market share, topping out at #1 in irons, #1 in fairway woods, #1 in hybrids and #1 in total clubs. Most sales should align with most searches. The search results align with some data from my own site. The single most popular post on GolfBlogger.Com is my review of the Callaway Apex Edge irons. If there is anyone from Callaway reading this, I would love the opportunity to do more reviews of your clubs. The results in Arizona and Oregon were not particularly surprising. Those two states are the headquarters of Ping and Nike, respectively. I expect that Nike will fall out of the searches as we grow more distant from its hard goods production. that offer such opportunities. I know players who always seem to have different “new to them” clubs, but who have never bought an actual “new” set. That secondary market doesn’t do a thing for manufacturers. I have often wondered how the overall market would react if one of the major manufacturers would significantly reduce prices across the board. For more Google search results analysis, see this post on The Most Googled Golf Course In Your State.